is responsible for market and technology research at European GNSS Agency (GSA) from 2010. She is also in charge of fostering Galileo use in consumer applications. Prior to joining the GSA, she held business management responsibilities in the telecommunication and IT industries. 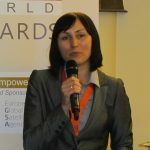 She has a Master degree in International Business from Poznan University of Economics and a Master in Business Administration from Leipzig Graduate School of Management (HHL).